Just as prayer is vital to the Christian's walk with God, so the activities of RHEMA's Prayer and Healing Center are important to the operation of Kenneth Hagin Ministries. The Prayer & Healing Center is centrally located on the RHEMA campus in facilities completed in 1982. From here, staff members coordinate four main prayer and healing outreaches: prayer school, healing school, prayer partners, and prayer groups. The Lord put it on Rev. Kenneth E. Hagin's heart to start Prayer and Healing School, and the first classes were held in 1979. At the outset, Rev. Hagin dealt with both prayer and healing in the same session. As time went on, however, he saw there was a need to separate prayer and healing to allow for more specific teaching on each subject. God's power and love are real. Every day we see them operating through our prayer lines and in Healing School. If you're passionate about seeing results, you'll appreciate knowing that the Prayer & Healing Center is designed to minister directly to your needs and help you gain your personal victory. Healing testimonies medically proven . . .
RHEMA's Prayer & Healing Center is where faith becomes a reality. Doctors can't explain it, but they do confirm it. Here are just a few of the medically-proven healing testimonies we've received through our Healing School and prayer ministries. Plan your trip to Healing School . . . Here is information you will need to plan your trip to Healing School - Hotels, car rentals, maps, directions, and more. Come work with our team to obtain your victory. Do you need someone to agree with you in prayer? Someone who will stand in faith and believe God with you? We have prayer workers here at RHEMA waiting to pray for your needs. Please call us…Monday-Friday, 8:15 a.m. to 4:30 p.m. (CST) at 918.258.1588, Ext. 5566. Or, you can email us. Write to RHEMA Prayer Partners today, and your prayer request will be forwarded to one of our prayer groups for prayer. Just fill out the form here. * Morning: Monday - Friday 9:30 a.m. - 10:30 a.m.
* Afternoon: Tuesday - Thursday 2:15 p.m. - 3:15 p.m.
* All morning sessions are held in the Prayer & Healing Center Auditorium. Center Auditorium during the summer months. * Morning sessions are open only to the sick and those who accompany them. 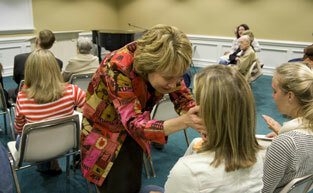 Teaching on faith is coupled with one-on-one ministry by trained healing technicians. 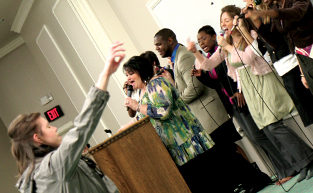 * Afternoon sessions are open to the general public and include teaching, preaching, praise, and worship. The focus is to help those in attendance expect to receive their healing now. * It is important for each person attending Healing School to be free from distractions in order to receive the most out of every session. Therefore, you must make child-care arrangements for infants and small children. We do not provide nursery or child care during the Healing School services. * If your child is the one in need of healing, you may bring him or her to Healing School to receive personal ministry, or you may attend alone - whichever you prefer. * We invite our Healing School guests to join us for services at RHEMA Bible Church, pastored by Rev. Kenneth W. and Lynette Hagin. SUNDAY - School of the Bible - 9:00 a.m.
* Prayer School is held during the school year Tuesday, Wednesday, and Thursday from 1:00 p.m. - 2:00 p.m. in SDC 1, Room 1278. All sessions are open to the public. * The primary purpose of Prayer School is to teach RHEMA Bible Training Center students, by precept and example, how to pray. 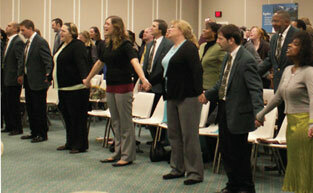 A typical session opens with worship and a teaching on prayer or a related topic, and concludes with a time of corporate or individual prayer. * As Healing School guests, we encourage you to participate in Prayer School as well. * Staffed by a dedicated team of volunteer prayer partners, telephone prayer lines are open weekdays from 8:15 a.m. to 4:30 p.m. (CST) at (918) 258-1588, ext. 5566. * Call us and a prayer partner will agree with you for your needs to be met according to God's Word. * Every day, throughout the day, groups of students, church members, and alumni meet in organized groups to pray for RHEMA and prayer requests from RHEMA's Word Partners and others. Approximately 475 volunteers are divided into 164 prayer groups, each with a specific prayer focus. * We invite you to send us your prayer requests by E-mail or regular mail to be prayed over by one of our experienced prayer groups.